Moss can be unsightly, especially if it’s in the middle of your lawn or garden. If moss is growing in your yard, then it is an indicator that there is something quite wrong with your yard. It’s important to understand the condition of your soil so that you can make it an uninhabitable place for moss. Fortunately, it isn’t too difficult to kill moss. Once you’ve gotten rid of the moss, it’s better to set your sights on making your yard a place that isn’t welcoming—which will get rid of it as well as prevent it from growing back. Since moss doesn’t have deep roots, you may be able to get rid of it simply by raking it up. If that doesn’t work, then an herbicide is your best bet for killing the moss. You have the option of buying a regular chemical or a natural herbicide. Many also suggest using dish soap as an herbicide because it doesn’t contain dangerous chemicals. However, removing the moss is only a temporary fix. If you don’t find out the culprit that is causing the moss to grow, then the moss will quickly reappear. 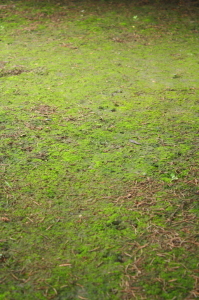 Moss thrives in soil that has a low pH. You should already be monitoring the pH levels of your soil to ensure that your grass is staying healthy, but if you are not, then the moss is definitely a sign of low pH levels. Once you’ve tested your soil and gotten rid of the moss, use a fertilizer that contains a high pH level to keep the soil balanced. Moss grows where there is excessive moisture, so a lack of drainage in the soil could be another reason that moss is growing in your yard. If your soil has a lot of clay, then it most likely won’t drain well. If your lawn gets a lot of traffic, then it could be that the soil is getting compacted by the pressure. Pooling in your yard after rain is another indicator of poor soil drainage. Does your lawn get enough sunlight? If in certain areas you notice that moss is growing where there is shade, then that could be causing an excess of moisture. Core aeration is a good way to fix soil with poor drainage. Once you have identified the reasons behind your moss growth, you can then go ahead and kill the moss that exists now. However, it is vital that you fix the underlying issue or the moss will simply return. If you are struggling with keeping moss out of your lawn, contact the experts at Greener Horizon. We’d be happy to help you with all of your lawn care needs.